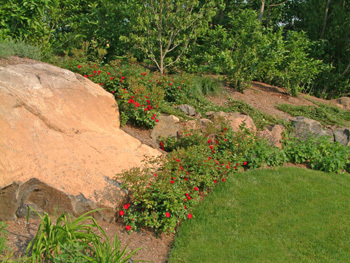 It's best to integrate landscape boulders naturally in the landscape, particularly when placing them in planting beds. They can also be used for retaining walls and are actually less expensive than many other wall materials. Read on but also see some of the following pages for other ideas and information. This large boulder was on the property and left there. Here are some guidelines for creating a natural look with boulders. The number of rocks to use depends on the size of the planting area. My "ideal" number is three. I like to place two closer together and one further away. The boulder sizes that you use are important also. In nature, you wouldn't typically find rocks or boulders that are the same size or shape. In your landscape, the same follows. Choose rocks that are different sizes. Stones anywhere from eighteen inches to five feet are appropriate. A good group would consist of, for example, rocks that are eighteen inches, two feet and three feet. Also, the rocks should have a similar look. If you went out in the woods or up a mountain, you would see that similar rocks are often together. You can go to a stone yard and see like rocks grouped together. Try to stay within the same "family". Another thing is that rocks should be dug down into the ground a bit when landscaping with boulders. This looks much better than just resting the rocks on top of the ground. You can dig down about 20 to 30% of the height of the boulder. Use some xeriscape plants or drought tolerant plants right up against the rocks. Sedums, Junipers and Cotoneaster are all good choices. This will add some softness to the landscaping boulders and to the landscape design in general. Entire landscape retaining walls can be created out of boulders. This works well when there are numerous boulders on site...either naturally or from blasting. Here is a photo of one such project. Major blasting had to be done for the house foundation and thus the rock was used for walls. 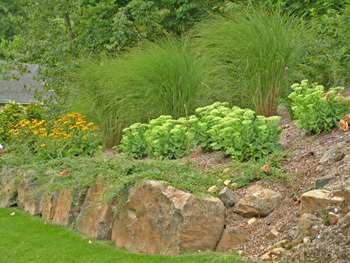 Landscape boulders can also be used to end a retaining wall. If a retaining wall is created and needs to meet grade, often the top of the wall steps down or the top of the wall is level and the ground slopes up. Sometimes a wall turns to meet the existing grade. Another option is to have the wall even and end it with a boulder. This adds a natural quality to the hard surface of the wall. I wrote this ebook to provide even more help specifically with front yard designs. Take a look to find out how it can help you. And if you'd like to know real pricing for almost all areas of landscaping, you will find this book extremely informative!